City Harvest Church Singapore was founded by Rev. Kong Hee, with twenty other Christians in 1989. 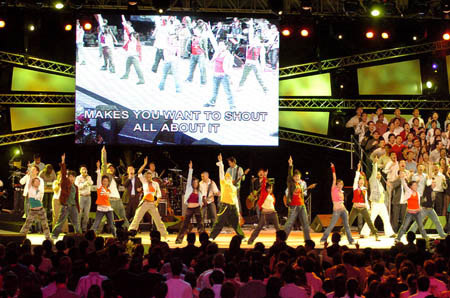 Today, City Harvest Church is one of the largest Christian youth organisation. Most of our members are below the age of 25 years old, and I am one of them! City Harvest Church uses an accurate and systematic method to account for our population and attendance by subdividing the whole Church into zones and cell groups. To God, numbers are important! Though I knew about Jesus when I was 7, I only started attending services regularly when I was 19 years old at City Harvest Church. Our Church is focused on reaching out to backsliders and non-believers. In City Harvest Church Singapore, we regularly invite well known and anointed evangelists such as Benny Hinn, Ulf Ekman, Phil Pringle, Sy Rogers, Joyce Meyers, John Bevere, Richard Roberts, Sy Rogers and many other gifted preachers to speak in our Church conferences and services. City Harvest Church was the first Church in the world to be awarded the ISO 9001:2000 certification on April 29, 2004 for quality management. City Harvest Church also has a television program called "Harvest Time". This is a 30 minute program which is broadcast on 11 satellites and Cable Television Networks. Harvest Time has a potential audience of about 637 million! In 2005, our Church launched the 5th live praise and worship album called "Cross". It comes with a dual music cd or single dvd. The songs are entirely composed by City Harvest Church's members. The music brings the presence of the Holy Spirit with it. And I have cried many times while listening to them. The vision of City Harvest Church Singapore is to build a Church with a strong spiritual atmosphere. Where the people can feel the presence of the Holy Spirit in every service. To ground the members in the word of God and to be active in ministry and ultimately international mission outreaches, particulary in Asia. 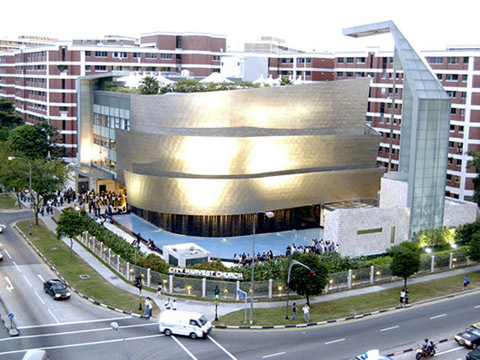 The building Of City Harvest Church Singapore was finally opened in 2002. It is located at Jurong West Street 91, about one and a half hours of transportation time from my home. It is a 8-storey complex. 4 of them are underground, including a huge basement auditorium. It took us about 7 years to raise the S$48 million for this building. This is the first titanium clad building in Asia. The building of City Harvest Church Singapore is modeled after the Guggenheim Museum Bilbao, Spain. To me, the most beautiful part of City Harvest Church Singapore is the fountain, which costs a staggering S$583,000 to build. Our services, conferences and prayer meetings are held in the 1,700 square metre auditorium, which is underground! Due to the explosive growth of our members, our weekend english worship services has been moved to Singapore Expo since 10 December 2005. The Church building is still used for Children's church, dialect church, chinese church, bible school and other smaller services and events. 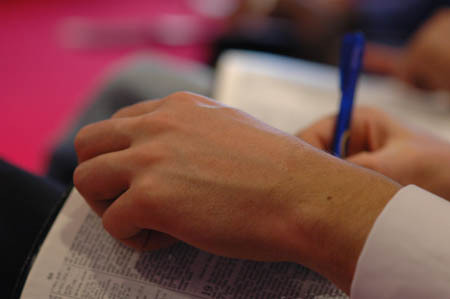 City Harvest Church Singapore maintains the bible study school, City Harvest Bible Training Center. Our church has been training pastors from many other countries and offers diplomas and advanced certificates joint America's Oral Roberts University. In the past 10 years, City Harvest Church's school of theology, more than 1000 students from over 30 countries have graduated from full-time theology courses. Since 2002, City Harvest Education has been registered with the Singapore Ministry Of Education. The purpose of City Harvest Education Center is to provide affordable and effective education to private candidates taking the GCE 'O' and 'N' level examinations. Return From City Harvest Church Singapore, To Holy Spirit Led Christian.